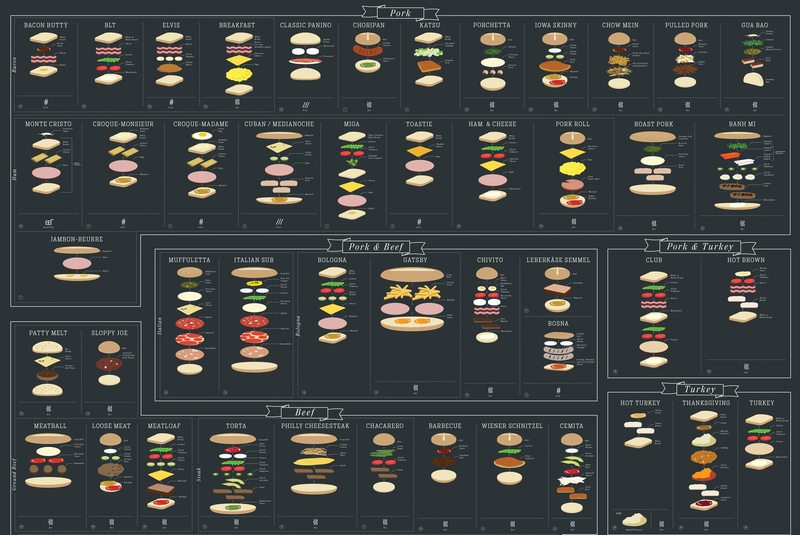 Lettuce introduce you to the most impressive sub-mission yet: A savory chart of sandwiches! Featuring an internationally inspired, mouthwatering menu of nearly 90 hand-drawn heroes, gyros, and much, much more—from the basic Bologna to the revered Reuben to the veritable food-pocalypse that is the gut-busting Gatsby—each enticing edible has been deconstructed into its various components and sorted by primary ingredient, along with notations for country of origin and serving temp. An open-faced love letter to the super-heroes of lunchtime, this delectable diagram makes for delightful decor no matter how you slice it. Using 100 lb. archival stock certified by The Forest Stewardship Council, this poster is pressed on an offset lithographic press with vegetable-based inks in Long Island City, New York. Each print is signed and numbered by the artists, and comes packaged in a Pop Chart Lab Test Tube.